John Kasich is losing to Trump in Ohio, where he is governor. 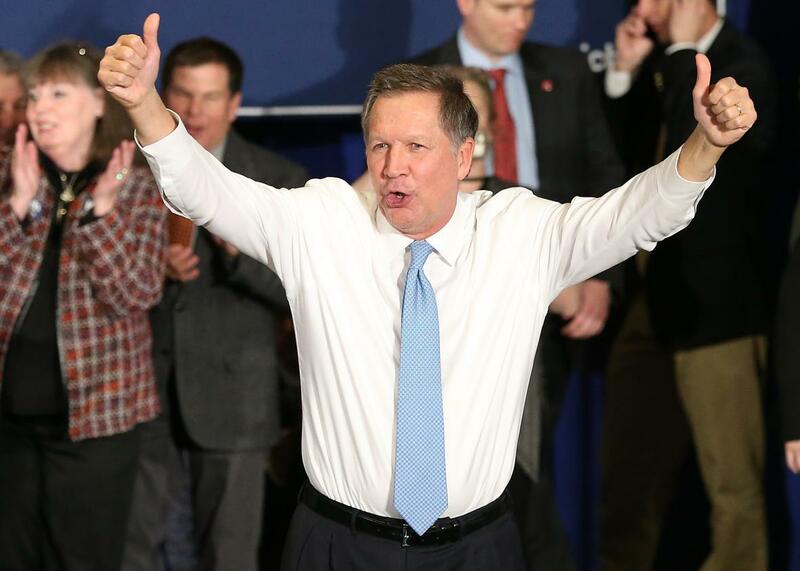 John Kasich waves to the crowd after speaking at a campaign gathering with supporters upon placing second place in the New Hampshire GOP primary on Feb. 9. Of the five Republicans still running for their party’s nomination, John Kasich has the narrowest path to victory. (Ben Carson does not have a path.) The Ohio governor posted a strong second-place finish in New Hampshire earlier this month but now has to find a way to keep his campaign afloat until the race reaches the Midwest in the middle of next month. That was going to be challenging in the best of times—the post–New Hampshire calendar is dominated by a monthlong tour of dark red states that don’t take kindly to Kasich’s brand of unapologetic conservative apostasy—but his case for sticking around looks weaker by the day. The latest hit came Tuesday by way of a new Quinnipiac survey of his home state. The Ohio poll shows Donald Trump leading the field with 31 percent, followed by Kasich at 26 percent, Ted Cruz at 21 percent, Rubio at 13 percent, and Carson at 5 percent. Trump’s lead is within the survey’s margin of error, so Team Kasich will see the results as a sign that their man can still win the state’s delegate-rich and winner-take-all primary on March 15. The Marco Rubio wing of the Republican Party—which is growing by the day—will see the results as a sign that Kasich can’t even pull away in his home state, where he was re-elected governor less than two years ago by a nearly 2-to-1 margin. The two other major Midwest nominating contests look even worse for Kasich. He’s currently about 20 points behind Trump in Michigan, which holds its primary on March 8, and 25 points behind Trump in the most recent GOP poll taken in Illinois, which holds its primary on the same day as Ohio. In both Michigan and Illinois, Kasich is running neck and neck with Rubio (and Cruz), but if he can’t better his establishment rival on his quasi-home turf, it’s unclear why he would in states with a more conservative Republican electorate. Kasich barely competed in South Carolina, where he finished a distant fifth last week, and he’s unlikely to do any better than fourth in Nevada on Tuesday night. The best he can reasonably hope for on Super Tuesday, meanwhile, is a better-than-expected finish in a state like Massachusetts, which will largely be a forgotten primary on a night that will also see winners declared in Texas, Georgia, and Tennessee. Kasich can make the argument that Rubio is also currently losing in the polls in his home state to Trump, as well as many of its nearby states. That is certainly a concern for Rubio—whose path to the nomination is narrower than he seems to believe—but the rationale for the Florida senator’s campaign has always been his ability to compete nationally by cobbling together support from across the Republican Party as the field winnows. In contrast, Kasich’s campaign is built on the premise that he can dominate in the more moderate Northern states that come after Super Tuesday. Rubio’s big advantage in this battle of path-to-victory arguments is that his theory can’t be disproven until after Kasich drops out.